On our second dive yesterday, a few of us got to go to a sandy patch reef to check out a big bommie (a large coral head). This bommie was the size of a large boulder, and served as a cleaning station. Schools of fish resided here and gathered around the bottom and sides, as in the bommie’s crevices were dozens of cleaner shrimp. I counted at least six different species. 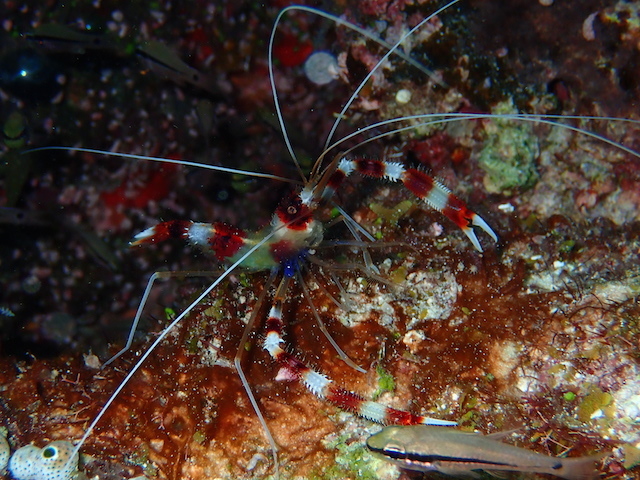 These shrimp wait for schools of fish to come by, and then they proceed to pick off parasites, bacteria, or dead skin. It’s like an underwater car wash for fish. A banded coral shrimp waiting in its hole, scouting for a fish to swim by to clean for a meal. A great opportunity to see symbiotic relationships at work! There is so much to see in even a square foot of space that its easy to just pick a spot and lay still for a while, observing all the interspecies interactions go on. This was my second dive at the spot, so it was a great chance for me to hone in on some close up underwater photography skills (which I’ve been enjoying improving each dive). I’d overheard that Professor Peterson had his hand cleaned the first time we got to check out the spot, so I was curious to try it for myself. 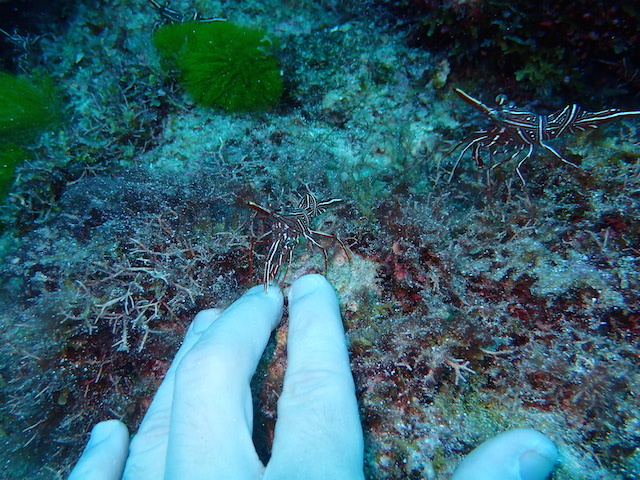 A little nervous at first, I placed my hand by a rock with a few Dancing Shrimp on it. After a few moments, they hopped on and began picking at the skin around my nails. Their pinching was certainly…thorough. I stayed for a few seconds as the shrimp went to work, and took some photos. It was truly an unforgettable experience, and just one of the many ways of feeling immersed in the environment around me. A dancing shrimp climbing onto my hand to begin picking away. If only I could always wash my hands like this.